How does one change a tire on an An-225? Behold the miracle of the, well, miracle fruit, a small berry that makes sour things sweet. Entirely unrelated, oysters from Long Island. Having seen Indiana Jones and the Kingdom of the Giant Box Office over the weekend (and enjoyed it rather very much—it is an Indiana Jones film, of a piece with the others in the series), I found this article that breaks down a scene in the original Raiders of the Lost Ark to be an fascinating read, and a peek in to the mechanics of how Spielberg builds a scene. Steven Moffat, the guy who wrote pretty much all of the best episodes of the new Doctor Who (among other things) has been promoted to run the whole shebang starting with season five. Pan Am playing cards throughout the years. We were talking about it at dinner today—it would seem that the first airplane I ever flew on was probably a Pan Am 747. Of course, that was back in the day when the airlines still did things like hand out playing cards…. Presenting Eurobad '74, the worst of European interior design from the 1970s. Seriously, I like modern design and all, and on some of the pages you can kinda see what the designers were going for, but my god, your retinas will burn. And in related news, Stephen Fry has released a podcast (which, for some unknown reason he calls podgrams) wherein he discusses Oscar Wilde, violence in America, and the value of interior design (it’s the most recent one unless you’re reading this after he released subsequent podcasts; also, for those who prefer consuming their words printed rather than aurally, there’s a fan transcript, too). Time to revise those Apple stock price targets to something that has four digits: chinese character functionality has been added tot he iPhone firmware. 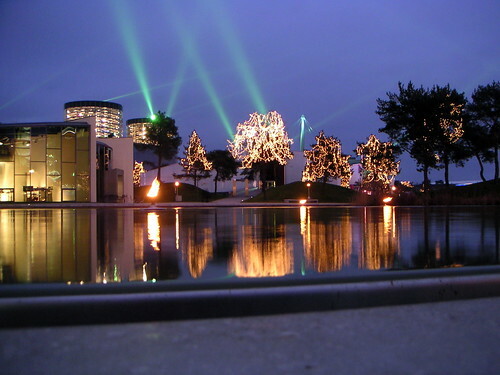 Autostadt at Night, Part I, originally uploaded by Frankenstein. The seven longest drives possible on Google Maps. Who’s with me?